Japanese writing paper, for the most part, is sized in accordance with international standard ISO 216. For our products that follow this standard (A4, B5, etc.) we state the size in either the product name or description. If the paper size is some other size, we provide the dimensions in millimeters. The ISO size closest to the North American letter-size paper is A4, which measures 210mm x 297mm, or 8.3 inches by 11.7 inches. Thus, the A4 size is slightly longer and skinner than the letter size. We carry several notebooks and pads in this size, as well as size A5, which is basically an A4 sheet folded in half. We also carry B-size notebooks and pads, with the most common being B5 (176mm × 250mm or 6.93 inches × 9.84 inches). The B5 dimensions are right in-between the A4 and A5 dimensions - so if you find A4 too large, and the A5 too small, the B5 might be just right. Perhaps the most well-known Japanese B5-size notebook of all time is the classic Tsubame brand - the cultural equivalent of the ubiquitous Mead Composition Book, albeit with much higher-quality construction and paper. Watch enough Japanese movies and you are bound to see students carrying Tsubame notebooks at some point! The upshot of the A vs. B sizing scheme is that, while they both have an aspect ratio of 1:1.414 (1.414 = the square root of 2), the sizes progress in an A-B-A fashion. In other words, B sizes are midway between their A-size numbered designations. 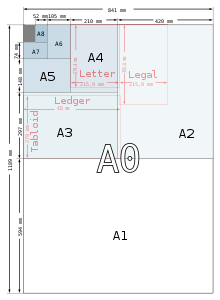 For example, in order of small to large, most of the papers we carry are B6, A5, B5, and A4. These are the most common sizes for notebooks and stationery. Please note that the A-chart below covers sizes all the way up to A0. A0 measures about 33 x 47 inches, so the A4 and smaller sizes are but a small portion of the entire chart. Sames goes for the B-chart. The largest B-size paper we carry is B5 (mentioned above). The B4 size is far larger than even a North American legal-size sheet, and not commonly used in notebooks and pads.